Taking a little detour from buildings I am looking at an object held within one of Limerick city's landmark's the Hunt Museum, formerly the Custom House on Rutland Street. My childhood has forever embedded thoughts my mind at this time of year around God, his mortal son and the Holy Ghost. Furthermore with his red robes this God the Father bares a likeness to what our modern society has replaced all that with- Mr Santa Claus. The Late Gothic/ Early Renaissance panel painting God the Father (h50 x W42 cm) attributed to Nicolas Froment is housed in the Treasury in the Hunt Museum, Limerick. It has been part of the Hunt family’s private collection since roughly 1952. Archival information on this piece mainly comprises of excerpts of scholarly texts containing basic facts such as title, medium, attribution, date of creation and dimensions. There are no dates of acquisition, receipts, invoices, stock books or insurance records but it was most likely bought at an auction house. Invaluable sources of information on this work are The Hunt Museum; Essential Guide and 50 Treasures of the Hunt Collection .Little is known about Froment as he is underappreciated outside his native France which adds to the mystery of this fragment of the altarpiece. Nicolas Froment, French painter and draughtsman, was born in Uzés (Languedoc), Picardy, twenty-five miles west of Avignon most likely in the year 1435.According to Uzétian local legend, Froment’s father was the barber and ‘homme de confiance’ of a bishop of Uzés which would explain how this young man with no connections and no family precedent of an artistic career could have received papal commissions. It is difficult to estimate his date of birth as well as the particulars of his early life due to the lack of information available on Froment prior to the 24 June 1465 when he is recorded as being an inhabitant of the Languedocan village of Uzés near Avignon. By 1468 he was a permanent resident of Avignon as he was recorded as paying rent on a house owned by a local barber. It was in Avignon that he would live and work for the rest of his days up until his death in either 1483 or 1484. His active life is recorded as starting in 1450 with his first signed and dated work the Resurrection of Lazurus (1461) (175 x 200cm; Uffizi, Florence) as the 18 May 1461 which is the date inscribed on the triptych’s exterior wing frames. Froment was probably a master at the time as apprentices were generally forbidden by guild rule to sign works on their own. However Froment’s name has not been found in Netherlandish guild lists of the period. Nevertheless he could have worked without guild affiliation as a court painter. The altarpiece was commissioned by Francesco Coppini, Bishop of Terni and Pal Legate who is depicted on the exterior wings praying to the Virgin. He brought back the piece to Italy in early 1462 where he gave it as a political gift to Cosimo de’ Medici who donated it to the Franciscan convent of Bosco ai Frati in Mugello just before his death in 1464, when it remained until the late eighteenth century. During this time in the Netherlands Froment has also been ascribed, in collaboration with Jacques Daret of Tournai, cartoons for tapestries produced in 1460 for Guillaume de Hellande, Bishop of Beauvais (Beauvais Cathedral; Boston, Mus.). Also attributed to Froment and in a related style are a Mourning Virgin, a fragment on oak of a larger panel and a drawing with the upper part of a ‘Transformation.’ In 1470 he was commissioned by Catherine Spifami, widow of Langier Guiran, to paint an altarpiece of the Death of the Virgin with SS Mary Magdalene and Catherine with donors on the wings, for a chapel appended to Notre-Dame-de-Consolation in Aix-en-Provence. He is also supposed to have painted the Martyrdom of St. Mitre (Aix-en-Provence, St.Sauveur), a commission for Mitre de la Roque, a merchant, for his funery chapel. In 1471-2, on commission of the spice merchant Pierre Marin, Froment produced a window of the Annuciation for the choir of St. Pierre at Avignon. In 1473 he designed the embroideries for the uniforms of Avignon’s couriers and props for ‘tableaux,’ including the ‘Temple of Jerusalem’ erected for the entry of the papal governor Charles II of Bourbon. In 1476 Froment painted 204 shields that included the arms of the Papal Legate Giuliano della Rovere. The following year the city ordered from the artist fourteen ‘écheafauds’ for the feast of Corpus Christi, including scenes of the ‘Temptation of Christ’, the ‘Annunciation’ and the ‘Story of Gideon’ Froment’s work for the Town Council attracted the attention of René I, Duke of Anjou in 1475 who would remain his primary patron until his death in 1480. It is during these years that Froment produced his major work, the triptych of the Burning Bush (410 x 305cm; Aix-en-Provence; Cathedral of St. Sauveur). In this piece Froment illustrated his application of the Flemish style to the landscape of Provence which explains why at one time the triptych was wrongly attributed to Jan van Eyck and to Jan van der Meire in the nineteenth century. If wealth is a measure of an artist’s success than Froment was successful enough to purchase three adjacent houses on the corner of place Piuts-des-Boeufs near the Papal Palace. There is little information on Froment’s marriage but he did produce a son, Nicolas the Younger, who moved to Spain after his father’s death where he also enjoyed artistic success as a manuscript illuminator for the Cathedral of Barcelona in 1500 but by 1511 he had become a wealthy merchant returning in 1513-14 with his Catalan wife to Avignon where he died in 1522. The fact that Froment enjoyed success in his own lifetime is a real achievement as Italian art was so admired and revered during the fifteenth century that works of French artists were simply ignored or disdained. In response Froment, along with another French painter, Enguerrand Charonton (1410-1466), set up their own school in Avignon around 1450. They formed the core of the realists of the school of primitive artists of Provence and are credited with introducing Flemish naturalism into French art. This painting in the Hunt museum is most likely a small section of a much larger wooden altarpiece with its dedication being to the Trinity. It could have been the central panel of a triptych commissioned by René I for his private chapel at his residence in Aix-en-Provence, as a visual compliment to the altar. It is ambiguous why this part would be removed and of the whereabouts of the remainder of the altarpiece. It is not an uncommon occurrence and it could be due to the tightened restrictions placed upon church adornments during the Catholic Reformation. This movable, functional piece would have been placed either in front or hanging above the altar playing a vital visual role during the moment the priest holds up the Eucharist during the act of transubstantiation as a focus for worship. The Trinity would have been particularly effective in this respect as the image of Christ would remind the laity of his sacrifice and of the promise of salvation. The altarpiece’s other general purpose would have been to teach the illiterate churchgoers the concept of a three-personed God. Historically Froment would have been painting this altarpiece only a century after ‘The Great Schism’ of the church when the Roman Catholic and the Eastern Orthodox branches split even to this day over differing doctrinal interpretations of the bible with one of the main arguments being the Trinity. The word ‘trinity’ itself is not stated in the New Testament but the concept of it is mentioned in Matthew 28:19. This was defined at the Council of Nicaea in 1439 so it was a fairly topical subject for Froment to depict. A commission for an altarpiece was quite a common phenomenon in the fifteenth century largely due to the result of the growing initiative of non-ecclesiastical and non-aristocratic patrons. It is possible that, like the Burning Bush, René’s image could have adorned the side panels alongside his chosen patron saints. René, like all patrons, would have had his favourite saints and in return for the special devotion paid to them. The saints were expected to plead the cause of their devotees in the court of heaven, reducing the individual’s allotted period of suffering in purgatory. The Catholic Reformation the following century put strict restrictions on such practices. Analysis of the design itself reveals that it is Netherlandish in its realism and attention to small details such as the effect of light falling on individual hairs on his long white beard. This work is figurative and vertical in orientation. God is depicted bare-headed which is quite uncommon but a good way to portray old age. However the provincial origin of Froment emerges in the harsh rendering and the stiffly-posed figure and angular folds on his robes. The human portrayal of God is out of proportion as his head is clearly too small for his body. It is an old man floating in a two-dimensional space against a plain gold background which is reminiscent of Robert Campin’s Seilern Entombment. Volume is not suggested through shadow or shading but instead through colour. God is wearing a rich red robe, the colour of royalty indicative of a god sitting on his heavenly throne, beneath a blue mantle. The attribution to Froment would be based on the occurrence of this red colour in another of Froment’s documented paintings. Other characteristics that indicate that this is a Froment painting or a follower of his are God’s sunken cheeks which can be seen in the various figures in The Resurrection of Lazurus, and his grimacing, down-turned corners of his mouth. This style of facial expression is considered to have been influenced by styles which do not survive. Of course this was painted in an age of a judgemental god demanding our awe and reverence. His facial expression fits within the theory that this is the upper part of a Trinity similar to Masaccio’s (1401-1428) The Holy Trinity, the Virgin, St. John and donors (Santa Maria Novella, Florence, 1427). God is showing the viewer his only son, possibly on a crucifix or else as a lamb, suffering for all our sins. The dove representing the Holy Ghost would be between Father and Son with its wings spread as if about to take flight. It was only towards the latter part of the fourteenth century that God and Christ began to be differentiated from each other pictorially. Before this Father and Son were seated beside each other with identical costume and features and even portrayed in some cases as the same age. Once separated Christ was bear torsoed and given the marks of his suffering with the crown of thorns and the cut on his side. This began the tradition of the bearded old man in plain robes to reinforce the idea of all people, rich or poor, being the children of one universal father. God too began to assume a larger body in relation to Christ. Perhaps denoting importance as the creator of all life. The difficulties of representing the three entities of God had been largely resolved by the fifteenth century although the church was still uneasy about how the theological complexities were rendered visible by artists. Iconographically the Holy Trinity is probably the most well known art motif and also the most complicated. The difficulties of representing three persons in one god had been resolved by the time Froment was painting this trinity. However the Catholic Church was still uneasy about images such as these bordering on idolatry. The use of images was another issue that split the Eastern and Western Churches. Early attempts at painting the Trinity without portraying Jesus and the Trinity were unsuccessful with obscure analogies and symbols such as water, snow and ice or the identical reflection in several fragments of a broken mirror; heat, brilliance and light linked in a fire; and a rose tree, its flowers and its fragrance as recommended by John of Damascus. The Trinity eventually evolved into a more human image with experimentation of different formulae such as three men [e.g. Jean Fouquet’s Le Couronnement de la Vierge’] or three sheep (or lambs). Another version that appeared in later Medieval and Byzantine art from readings of the Old Testament was of the Trinity as three heavenly visitors (or angels) whom Abraham hosted (Genesis 18:1-8), i.e. three identical seated men in a symmetrical arrangement of equal size e.g. The Holy Trinity by Andrei Rublev. In the fifteenth century the Trinity that we associate with today of a patriarchal Father, a suffering son or a lamb and a dove emerged. God over the centuries began to assume a larger figure in the Trinity and seated above Christ. Nevertheless the tradition of depicting God and Jesus the same size , though rarely, still carried on during the mid fifteenth century as for instance in Enguerrand Quarton’s Coronation of the Virgin (1453). The painting was commissioned by the Carthusian monastry at Villeneuve-les-Avignon. The contract drawn up still survives stressing that “there should not be any difference between [God] the Father and the Son.”The dove became the symbol for the Holy Spirit because of Matthew 3:16. The bird should specifically be a dove but it often looked more like an eagle, a goose or a stylised creature of no recognisable species. The human figures were an attempt to make the cornerstone of Christian belief into an idea that meant something to the common man. Sadly there is little evidence of how people did react to such images. It is known however that images of the Trinity became more and more popular due partly to the impact of the Black Death (1348-50) and later epidemics. A judgemental God showing the sacrifice of his son reminded parishioners of their temporary existence in the world of the living. In Christianity mankind is held to be the children of God created in his likeness, still retaining some traces of his image though distorted by the fall. As for its place within the western canon of art Froment’s painting is in the group of works after Masaccio’s famous fresco The Holy Trinity (667 x 317cm). This painting was to have a huge affect on artists that came to Florence for the next two hundred years. More than likely Froment was aware of this painting and, as already stated, his Trinity is thought to be in the style similar to Masaccio’s with the composition symmetrically centred on the body of Christ. The next major work of this kind would have been Fra Angelico’s Virgin and Child Enthroned with SS John the Evangelist, John the Baptist, Mark and Peter (1433-6; Florence, Mus. S. Marco). Examples of Froment’s contemporaries depicting the Trinity are Enguerrand Quarton in France with his Coronation of the Virgin and in Germany the Polish artist Jan Polack (1435-1519) with Gottes Not (200 x 155cm; Munich, Bayer. Nmus.). Later generations within this same genre would be Albrecht Dürer’s(1471-1528) Adoration of the Most Holy Trinity by the Communion of Saints( 135 x 123cm; Vienna, Kunsthistorisches Mus.) in 1511 and the Spanish artist José de Ribera’s (1591-1652) Holy Trinity in 1635(226 x 181cm; Osuna, Mus.A Sacro). This last example follows the same order of God the Father bearing the weight of Christ but this Christ is of the Caravaggio tradition of the weighty figure drenched in light and wearing his blood-soaked loin cloth. These works show the natural progression of increasing realism and pathos. Although never large in terms of population, Uzés was a town of historical significance and contemporary importance in the fifteenth century, when Froment would have been growing up there. Originally a primitive campsite and then a Celtic settlement, its location on a limestone plateau above the Alzon Valley made it desirable to the Roman invasion troops who established an advance camp there called Castrum Ucetiense. Christianity spread to Uzés as early as the second century, and the Roman Temple of Mars, directly overlooking the valley to the east, eventually became a place of Christian worship. At the beginning of the fifth century, Uzés was made the centre of one of the most important bishopries of the Church of Languedoc. Froment in all probability had launched his artistic career in Avignon by 1465 then a bustling, affluent cosmopolitan area of around 100,000 inhabitants. Conditions there could not have been better for a talented young artist with good credentials, as painting in particular thrived. The departure of the popes from Avignon was in no way detrimental to the activity of the important community of the artists that had developed in the city during the reign of the papacy there from 1309-1377. Over the next century or so, churches continued to be built and embellished, private residences of aristocrats, wealthy merchants and religious continued to need renovation and decoration, and the Palais des Papes itself continued to be renovated and expanded, first by the antipopes (1378-1419) and then by the papal legates and governors appointed by Rome to rule Avignon as an Apostolic Seat. Froment’s Avignon contemporaries would have included such artists as Enguerrand Quarton from Laon, Pierre Villate from Limoges, Thomas Grabuset from Besançon, Armand Tavernier from Lyon, Martin Pacaud from Bourges and Jacques Paperoche from Picardy. In spite of their diverse origins, they collaborated on commissions from the city fathers and from private patrons, and they received individual commissions from the same patrons such as René of Anjou. Thus stylistic influences and resemblances among the works of these Avignon-based artists must have been sufficient to define a “school” for that particular point in time, even though its exact nature is unknown. New Netherlandish influences enriched the earlier Italian trends to produce this school of painting that was at once dramatic and richly detailed. Comparatively few Provencal works from the fifteenth century are still extant and an even smaller number are connected with known artists or are precisely dated. This lack of knowledge about the specific artistic atmosphere encountered by Nicolas Froment in Avignon in the mid 1460s contributes to the difficult problem of identifying sources of influence that might have caused Froment to put so much stylistic distance between his ‘Lazurus’ done in the Netherlands in 1460-1, and his Burning Bush done in Avignon or Aix around 1475-6. What is known about the period immediately following his return to the south of France is that Froment’s reputation as an artist grew and spread rapidly. To put this work into context, patronage was vital to artists back then but as a result of the outbreak of the Hundred Years War (1337-1453) political instability among the Valois princes led to a decrease in Royal commissions for artwork. However the Court of René I, (1409-1480) (4th of Duke of Anjou (Duke of Lorraine; Titular King of Naples and Sicily, Hungary and Jerusalem) to give his full title, became an important artistic centre in mid fifteenth century France. René I held his residence in the city of Avignon and was Nicolas Froment’s principle patron from 1475 to 1480. His family connections were impressive as he was the brother-in-law to Charles II, King of France and the father-in-law of Henry VI King of England. The variety of his domains from western and eastern France to southern Italy influenced the art he commissioned. His enforced stay as a prisoner of Philip the Good, Duke of Burgundy during the struggles for Bar and Lorraine (1431-2, 1435-7) most likely brought him into contact with Netherlandish painters. The earliest record of the artist-patron relationship between Nicolas Froment and René is an entry in the accounts kept by René’s treasurer, Jean de Vaux, for the year 1476. His first commission was the iconographically complex Mary in the Burning Bush in 1475 which now hangs in the south wall of the nave of the Cathedral of St. Sauveur in Aix-en-Provence. This triptych depicts René of Anjou and his second Jeanne of Laval with several saints and was originally made for the Church of the Grands- Carmes in Aix, where it hung until the French Revolution. This altarpiece also depicts God as a half figure, in a carved panel above the central scene. On the exterior wings of the altarpiece, the archangel and the Virgin stand in niches of a masonry wall. Several entries appear in René’s accounts of 1477 for payments made to “maistre Nicolas peintre” but it is not until 14 November 1477 that an entry occurs with the full identification of this artists as “Nycolas Froment, paintre du Roy de Sicille.” The Hunt Museum’s identification of René commissioning this painting, if it is a Froment, is more than likely correct as well as the year of completion being 1475/6. Froment himself left no records behind so this attribution is based on speculation. The time and place of their first meeting is unknown or how Froment was brought to René’s attention. Nevertheless it has been speculated that René was a painter himself and that the young Froment was his protégé therefore developing his Netherlandish style to please the taste of his master but there is no evidence to back this claim. It is known however that René was in Provence from December 1437 to April 1435, October 1442 to February 1443, in 1453-4 and again from May 1457 until January 1462 and that he made visits to Avignon during these periods. René could have possibly encountered Froment’s many artistic works for the Town Council and it is also believed that Froment might have worked on the house and chapel of the Bishop of Uzés, Jean de Mareuil in 1465 bringing him to the attention of local officials. If Froment was not brought to René’s attention in the 1460s he would certainly have moved into René’s social sphere when he was called from Avignon to Aix in early 1470 to work for Catherine Spiefami Guiran, widow of Lanugier Guiran to paint an altarpiece. Froment must have flourished under the direct exposure of René who was a serious literary scholar, linguist, writer, poet and painter. It is René’s writings on a variety of subjects such as religious morals (Mortifiement de Vauvie Plaisance) that distinguishes him from most contemporary patrons. From 1477 onwards Froment was working exclusively as René’s ‘peintre du roy’ a position once held by Barthélemy d’Eyck. Aside from the general decoration of the Avignon premises of the duke, Froment continued to produce individual paintings for his patron. He was paid by René for ‘certain paintings which the said lord has devised’ which could indeed include God the Father. Unfortunately, apart from the Burning Bush, the Naval Combat of Turks and Christians is the only painting produced for René by Froment which is identified by subject matter in the accounts of payment. A portrait diptych of René and his wife known as the Matheron Diptych (1476) [Appendix C]preserved in the Louvre since 1891, is widely accepted as a work of Froment or his studio. Nicolas Froment’s last known task for the duke was the repainting of his horse armour in November 1479. The death of the duke on 10 July 1480 undoubtedly had serious consequences throughout the Provencal artistic community. In hindsight this event can be seen as a catastrophe for Froment who devoted five years of his life to satisfy René’s artistic needs. Froment, who had maintained his residence and workshop in Avignon during the René years, reverted back to his status as an independent artist. Only two commissions are recorded as being completed by Froment after his court career with both of them being from the city of Avignon. Therefore Froment’s attempt to regain his former level of professional activity was probably not successful. The materials of this piece are typical of the age. It is executed on an oak panel which would have been the most suitable wood for a triptych for its stability and durability. The type of wood employed can be used in determining its origins.Oak was used almost exclusively in the North for panel painting in the fifteenth century onwards as opposed to other softer woods more frequently used in the south of France and in Italy such as walnut, poplar, pine, spruce, cherry, etc. Although the use of oak is not positive evidence in itself of the Northern origin of a panel painting but oak panels have been called “l’essence- type des écoles de Nord.” On a summation graph for panel painting in various European countries in the fifteenth century Jacqueline Marette lists Italy’s over-all usage of oak at just 1.5%. Poplar was employed in Froment’s only other documented work Burning Bush (1475) and the Matheron Diptych. Before the actually painting could begin the panel had to be first coated with a white plaster providing the artist with a highly polished surface on which to paint. 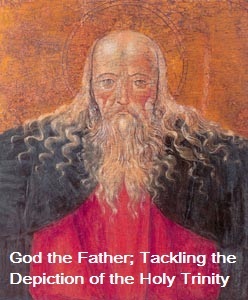 God the Father was done probably in a mixture of egg and oil tempera to bind the pigments hence the fine network of cracks that can be seen on the painting’s surface especially on the gold background. The use of gold was to denote the patron’s wealth as it was in short supply in Europe by this century. It was in the middle of this century that novel oil painting methods were being introduced from Northern Europe. In these transitional years the egg medium was often used in combination with separate layers of oil-based paints, either for lighter coloured areas or more particularly as a quick-drying under-paint for subsequent oil-based glazes. Depending on the number of layers a panel painting with take several months to complete when the drying-period is taken into consideration. The painting is in overall good condition and small cosmetic defects such as varnish been too glossy or relative humidity damage (RH) are stated in the collection survey form. This work is displayed on the ground floor in the room known as the Treasury and, as with the rest of the Hunt Museum, it groups its objects by genre. Along with Froment’s God the Father this room includes other religiously themed works of special interest such as The Galway Chalice, The St. Patrick Reliquary Bust and The Bernardo Daddi Crucifixion Scene. This panel painting is hung behind glass in an alcove in the shape of a Gothic arch. Within this individual display is The Arthur Chalice which is housed on behalf of the Roman Catholic Diocese of Limerick. The Treasury is a great example of how some museums try to place an object within its original intended cultural setting. This is important as it cannot be forgotten that this work is a functional piece and was never intended to be looked at for its aesthetic value but to draw awe from its viewer. Its bright rich colours and gold background were meant to jump out from its dark, solemn surroundings in a Gothic church which would have had little natural light, recreated here by the museum. There is clever use of light with just the one, almost celestial light source coming from above the painting. The impact of this painting would have been lost if it was placed on a white wall along with its artistic and religious heritage. The painting itself is framed within what looks like a temporary hard wood frame that has been amateurishly aged with dabs of yellow paint when viewed up close. The frame’s inappropriateness was noted in the collection survey form. Promotion of this painting is important as it can facilitate the viewer’s understanding of fifteenth century Western culture. Museums of all kinds play vital roles in the characterization and evaluation of cultures and it is their duty to communicate this information to the public as the museum needs the public just as much as the public need the museum. The Treasury is a fascinating collection of religious relics, paintings and especially altarpieces. Even in our modern world where religion does not play as large a role in our lives as it once did, it is still beneficial to see how the lives and sacrifices of various saints, the sacraments of mass and the afterlife weighed heavily on their minds. It moulded their lives and their interactions with each other; it was part of their weekly ritual as well as providing a gathering place for the community. This work should be promoted as a glimpse into a culture that was dictated by the Church which has resonance with our own country as the same could be said of Ireland up until at least the 1960s. One does not have to be particularly religious or spiritual to appreciate the craftsmanship that went into assembling this altarpiece. The people of Limerick are very fortunate to have such an historic artefact on their doorstep by an artist who has work exhibited in galleries in France, Italy and the United States. As with most things public taste in art goes round in cycles as Froment and other Gothic ‘primitive’ artists gained popularity in the Victorian era as with all things Gothic and again in the 1930s when John and Gertrude Hunt began collecting around Europe. Limerick is concentrating its efforts more and more to promoting its medieval heritage so hopefully it will start to showcase Nicolas Froment’s God the Father and similar works. Art Treasures in Thomond held at Limerick Art Gallery, (Limerick, Limerick Leader, 1952), p.3. Helen Armitage, The Hunt Museum; Essential Guide, (London, 2002). Patrick F. Doran, 50 Treasures of the Hunt Collection, (Limerick, The Hunt Museum Executive, 1993). This is based on the assumption that Froment had completed his apprenticeship and was of legal age, i.e. twenty-five years or over, by the time he received his commission to paint the Resurrection of Lazarus in 1460. [Marion Lou Grayson, The Northern Origin of Nicolas Froment’s ‘Resurrection of Lazurus’ Altarpiece in the Uffizi Gallery, (PhD. diss., Columbia Uni., 1979), p.6. Baronne de Charnisay ‘Les chiffres de M. l’Abbayé Rouquet: Étude sur les fugitifs du Languedoc [Uzés]’, Bulletin de la Société de l’Histoire de Protestantisme Français, lxv, 1916, p.138. Marion Spears Grayson ‘The Northern Origin of Nicolas Froment’s Resurrection of Lazarus Altarpiece in the Uffizi Gallery, The Art Bulletin, Vol. 58, No.3, (Sept.,1976),p. 350. The last record of the living artist is a distribution of grain made to him on 21 March 1483 by Paulet Heydine, treasurer of grain in Avignon. He was definitely deceased by 23 Dec 1484 when his property was sold. [Ibid.]. Helen Armitage, The Hunt Museum; Essential Guide, (London, 2002), p.29. Emile Male, Religious Art in France, (Princeton, 1986), p.53. Charles Sterling. ‘Tableaux Français inédits: Provence’, L’Oeil, 425, (Dec., 1990), pp.46-53. Grayson, ‘Resurrection of Lazurus’ p.357. F. Joubert, Jacques Daret et Nicolas Froment: Cartonniers de tapisseries, Rev. A, 88, (Paris, 1990), pp.39-47. It is also believed that he possibly had a second son who died very young. Peter Humfrey, The Altarpiece in Renaissance Venice, (London, 1993), p.57. Hunt Museum Archives [Assessed 5/12/07] Ref No: HM/ARCH/A1/01388(7). Male, Religious Art, p. 47. John Bowker, God- A Brief History; the Human Search for Eternal Truth, (London, 2002), p.286. Ursula Rowlett, ‘Popular Representations of the Trinity in England, 990-1300,’ Folklore, Vol. 112, No.2, (Oct., 2001), p.207. Leslie Ross, Medieval Art; A Topical Dictionary, (London, 1996), p.251. R.N. Swanson, Religion and Devotion in Europe, c.1215-c.1515, (Cambridge, 2000), p.87. Craig Harbison, The Art of the Northern Renaissance, (London, 1995), p.67. The Spirit of God descending like a dove and alighting on him.’ [Tim Dowley (ed. ), A Lion Handbook; the History of Christianity, (Edinburgh, 1996), p.334. Don Denny, ‘The Trinity in Enguerrand Quarton’s Coronation of the Virgin,’ The Art Bulletin, Vol. 45, No.1, (Mar., 1963), p.49. H. Chobaut, Avignon et le Comtat Venaisin, (Paris, 1950), pp.51-3. Grayson, Resurrection of Lazurus, p.356. His first marriage was to Isabelle of Lorraine in 1420. She died in 1453 [Grove Art]. Emily Harris, ‘Mary in the Burning Bush; Nicolas Froment’s Triptych at Aix-en-Provence,’ Journal of the Warburg Institute, Vol. 1, No. 4, (Apr., 1938), pp.281-86. Charles I. Minott, ‘A note on Nicolas Froment’s “Burning Bush” Triptych,’ Journal of the Warburg and Courtauld Institute, Vol.25, No.3 / 4, (Jun.-Dec., 1962), pp. 323-325. Grove Art Online.Asessessed [7 Nov.2007] http://www.groveart.com. Yoshiaki Nishino, ‘Le Triptych de l’Annonciation d’Aix et son Programme iconography,’ Artibus et Historiae, Vol. 20, No.39, (1999), pp.55-74. L.H. Labande ‘Notes sur quelques Primitifs de Provence Part II: Nicolas Froment,’ Gazette des Beaux –Arts, IX, 1933, p.86, n.1. Demarquay Rook, Grove Art Online. Oxford University Press. Charles Sterling, ‘Nicolas Froment, peintre du nord de la France’ Études d’art medieval offertes á Louis Grodecki, (Paris, 1981), pp.325-36. M. Laclotte and D. Thiébaut, ‘L’Ecole d’Avignon,’ (Paris, 1983), pp.219-20. F. Perrot, J.L.Taupin and F. Enaud ‘Le Roi René Avignon’, Archéologie, No.73, (August, 1974), pp.21-38. Jacqueline Marette La Connaissance des primitifs par l’etude du bois du xlle ai xvle siècle, (Paris, 1961), p.74. The Hunt Museum Collection survey form [4/12/96]. Museum Archives Ref No: HM/ARCH/A1/01388(4). Peter Jones,’ Museums and the Meanings of their Contents,’ New Literary History, Vol. 23, No. 4, (Autumn, 1992), p.911.